Smith’s Food and Drug, is the leading supermarket chain in South Western regions of America. They sell a selection of products including meat, seafood, fruit and deli goods with many stores offering pharmacy products, gifts and a feature allowing digital photos to be manipulated. The largest growth percentage of the company was between 1946 and 1958, which saw the company refurbished and see a gross revenue increase of 50 percent. Sadly, the founder died soon after this momentous growth spurt. Later in the 1960s the company was forced to expand out of the Brigham City area as the area was saturated with similar stores and in the next decade over 150 stores sprang up across South Western America. The most recent piece of history with regards to the business is the company being acquired by the Kroger Company in 1999. Since then they have moved on steadily adding loyalty cards called “Smith’s Rewards,” and gas stations, allowing shoppers to fill up, and to price check online. The company uses by the mantra “Market fresh, Money smart,” making reference to both the business and the consumer and basically means that you get fresh food for good prices. As part of the Kroger Company banner, they are targeted towards an audience of value shoppers. The company’s company headquarters at the following address: 1550 South Redwood Road, Salt Lake City, Utah 84104, U.S.A. Other important statistics are below. Special Services: Digital Photos, Gas Station, Phone Services and Pet Insurance. 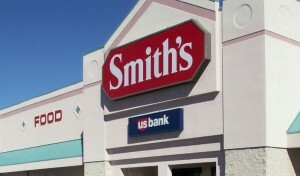 I am writing to inquire if it might be possible to open a Smith’s Grocery Store in the city where i live, Carlsbad, NM. Zip 88220. I was in one of your stores today in Albuquerque NM. I was happy to se you had a selection of Dave’s Killer Bread! My request is for you to start carrying Grandma Sycamore’s white sandwich bread in your store. I know it is carried in Utah and now in Wahington state. It would be so much appreciated by alot of consumers. Since you are taking over “Foor4Less” stores , will you carry the Vandekamp bakery items in the Smith’s chain, especially the “Western Hearth 12 Grain Bread”. We have shopped at both Kroger and Smiths stores for the past seven years. The Smith stores in Las Vegas 4051 S Buffalo 89147 and 9350 W Flamingo 89147 were OK, but lately these stores have gone downhill. I am handi-capped and use their scooter, but the 9350 W Flamingo now only has 1 or 2 and they are never available. The 4051 S Buffalo has 5 or 6, they are in a “gantlet” location next to the shopping carts are hardly ever charged and almost impossible to access. Why can’t they give a couple to the other store if they aren’t going to be used at the Buffalo store? In comparison the Kroger in Huntsville, AL specifically on Morris Mill road has 7 or 8 scooters they are always charged and easy to access. Also the Alabama store is much cleaner and you can easily find all the “sale” items listed in comparison to the Las Vegas stores. In general I would give the Kroger store an A- and the Smith stores a C-. I am with CafeelVaquero.com and we are looking to enter the US Market. We are a producer and supplier of high quality Mexican Coffee- Chiapas mountains region. We have a solid presence in Sonora Mexico where we roast and package our 25 coffee products. At the present time we are expanding into the state of Chihuahua and soon the US. I would like to explore how we can offer our products on your website. I have pricing and product information available. Please contact me at 972 322 2424. Sincerely, Jim Earley. Since building our home (2003) in West Valley, UT and the closing of our favorite Fred-Meyer we have been faithful shoppers at two Smith’s for the following reasons; courteous checkers, sugar free bakery products, and most of all gasoline points. Notice I did not say low prices as that was not a personal consideration of mine. This Mother’s Day morning has finally broke me away; I got there around 8:30 AM, parked near the west door to find it secured, walked to the east door to get a few items as I wanted toe fix dinner for my wife today. Throughout the store was stockers and facers; the isles were blocked and very difficult and dangerous to negotiate. Upon approaching the check stands I did not see any open except the automated which I refuse to use for personal reasons and being a former checker. A nice lady however insisted upon helping me and against my personal feelings I allowed her to check me out. I ask, “Is this the way it will be from now on?”, her answer was, “The other lady had to use the restroom.” I can understand that, but within a few feet of me I could very clearly see another 4 or 5 employees standing in the main area behind the checkouts not helping customers. After telling my wife that I am done with that store, she tells me about her experience at another store on Redwood Road; that there is a sign that says something to the effect that there are only automated checkouts until 10:00 AM. That’s it for us as you have also taken our points away from the previous month. I will miss the sugar free items, but a local baker has offered to take care of my needs and Wal-Mart is building a new store that will serve our needs and save us time, money, and frustration that Smiths has given us over the last few months. Money savings count and reward points helped, but personal service is our demand, so consider us gone to Wal-Mart until further notice. The Smiths store in our town in Mesquite, Nevada at 350 N Sandhill Blvd. has a large sign that faces Sandhill that has been completely out (dark) for weeks now. I have called the customer service department (twice) but nothing has been done and the sing remains dark. I would think that they would want that huge advertising sign to be lit but obviously it is not a priority to them. Perhaps you could relay this message that their lit signs should be, well, lit. Also, I notice that they let their smoking employees smoke out front near their main entrance. I think this sets a bad example and the smoke is NOT far enough from the main doors as you can easily smell the smoke as you go in and out of those doors. Perhaps these nasty smokers should go out back near the loading dock since no customers go back there… just a thought! My wife and I drive our cars to Smiths, she pulls up to the pump and I park right behind her. After I fill her tank, I hold the hose while she drives her car out of the way, then walks to my car, drives it to the pump and I then fill my car, taking full advantage of the discount. I have been a customer of Smith’s since I moved to Wy last year. I like the Riverton store and the people that work there. I take advantage of the coupons and the fuel points. The fuel points really help. I had enough points for 50 cents a gallon off. I went to the Loaf and Jug and put 15 gallons in my car then without hanging up the hose moved it to my truck expecting to put the balance of the 35 gallons in it. Wrong! The pump had shut off and wouldn’t restart. $10 worth of discount gone. That did not make me feel good about Smith’s. I feel that you should allow all 35 gallons to be purchased and not limit it to one sale. I will still buy from Smith’s in the future. However I won’t drive across town when Wal Mart is much closer to where I live. I have been a customer at Smiths in Riverton Wy for several months. I like the store, people, and coupons. The fuel points really help me out. I try to purchase most of my groceries there. Today I had enough points for 50 cents a gallon discount. When I tried to redeem them my car only held 15 gallons. I did not shut the pump off and transferred the hose to my truck so I could finish the balance of the 35 gallons I thought I was entitled to. The pump wouldn’t start up again. I feel I was not given the full value of the discount. I will probably still shop at Smiths for some things. However with Wal Marts lower prices I may purchase more and more from them. I feel you should revise your program to allow the 35 gallon purchase and not just one purchase only. I went to Smith’s today, on South Meadows Parkway, Reno, Nevada. I park in a handicapped zone. The zone was iced over and very slippery. Another person trying to get a wheel chair out of a car, finally gave up and left. I was in the store shopping, and I saw 2 gentlemen standing talking and laughing. I noticed one had a badge on his shirt that said “Manager”. I stopped and told him that he should have someone throw some snow melt salt out on the pavement in the handicap zone and why. He smiled and said he would take care of it. I stayed in the store shopping for another 20 minutes, and went to my car. I had a cart full of groceries. No one asked to help me, so I left for my car, as I got there, another car was pulling in and a man on crutches was getting out of his car. NO ONE HAD BOTHERED TO EITHER “SALT” OR SHOVEL the ice from the pavement in the zone. I told the people that I had requested something be done to the area, but it wasn’t getting done. I will not go back to that store….. I have been a shopper of the Fort Mohave store Since It opened. I have found the prices, store supplied very well, and alway courtious service. I am disturbed although I understand the motive behind directing shoppers to the most available checker. Sevral times in the past I have been hesitant to relocate check stands just because the next checker is available. It is alarming to be directed to a checker who has misplaced items. (They usually wind up in the bags of the person behind me. Or the checker that is in such a hurry some how two jars of oysters are cracked. I have been told to bring what ever is damaged back. Thats not always an option as it is 12 miles round trip. I hope the next time I am directed to the next available checker the directors will understand when I refuse.